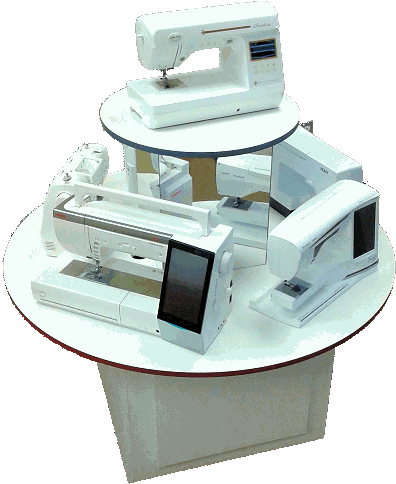 NEW in display fixtures and part of our Galaxy line! The Full Moon 64 has two display levels to accomodate up to several machines. The bottom table top is 54 inches in diameter with a pedestal top of 25 inches in diameter. 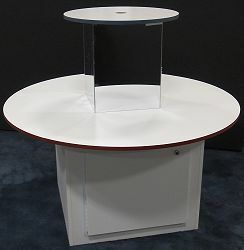 The pedestal sports durable Acrylic mirrors that give the pedestal top the illusion of floating above the table. Both tops have gommeted holes for clean wire routing. The base has a large door and a lot of space inside for storage. Available with optional heavy duty casters for easy moving. While supplies last, we have alternate edge banding colors available for the rings. Please, note the color number when ordering with an alternate color. Table height from floor 28"
Door opening 21" x 19"